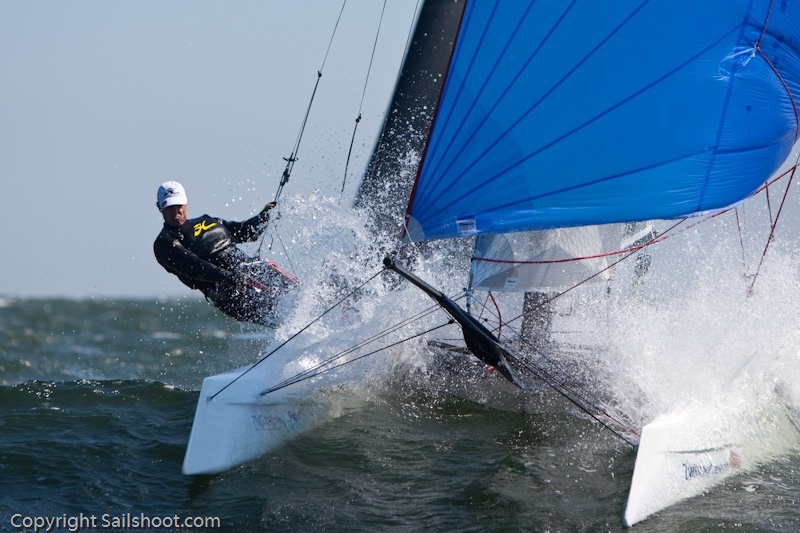 For sure one of the podium pics of the year, taken by Jasper Van Staveren from Sailshoot.com at Texel course racing. Many thanks to all the Professional photographers that send their material, this site is made possible thanks to their contribution. To honor them I'm preparing a special project for a Catsailing photography book. Thanks also to all the sailors and readers that are constantly pushing forward for Catsailing worldwide. Already seen A-Class Australia video, but still a good one for those new to the class. 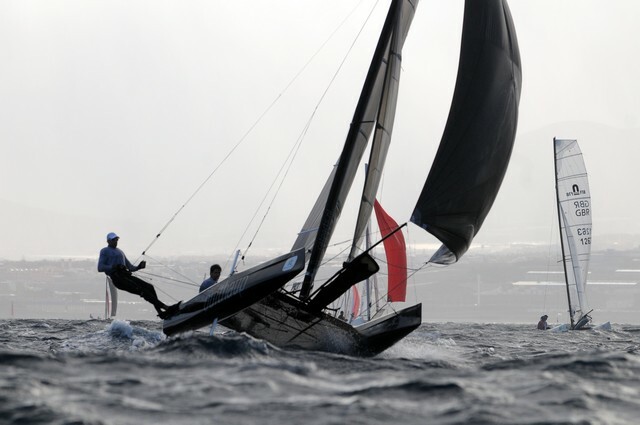 The championship will have a different view from 2009-2010, with a huge fleet of DNAs and some big names including Darren Bundock, Glenn Ashby, Steve Brewin, Andrew Landenberger, Mitch Booth, James Spithill, Dean Barker from TNZ and many more. Here is our latest vid for this year. With José and Olivier from the Yacht Club of Martinique. If you ask for the crash with the other wild cat....i don't know how it happened...a very bad day"
Full insight on design and performance of the Marstrom M5 A-Class. Interesting point of view of the most respected cat building company, Marstrom. The M5 is equipped with the must have features present in the latest A-Class and F18 designs, the only distinctive aspect is their bow. In a well designed hull the profile shape and cross section of the bow is not that critical as good volume, curved boards and a flat planing stern for ie, although at Marstrom they also believe that Wave Piercing is a trend that will fade away, I must say that I disagree with that specific statement. The M5 has no wave piercing bow, what is the reason for that? Our own full scale tests shows that "wave piercing" bows gives more drag than our normal bow for a certain tip moment and the lack of reserve displacement at the bow makes "wave piercing" boats much easier to tip over. 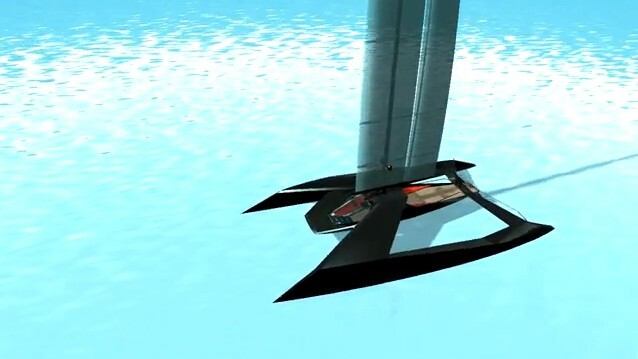 Another disadvantage with "wave piercing" bows is that the more narrow deck makes the hulls much less stiff and contributes to a less rigid platform. 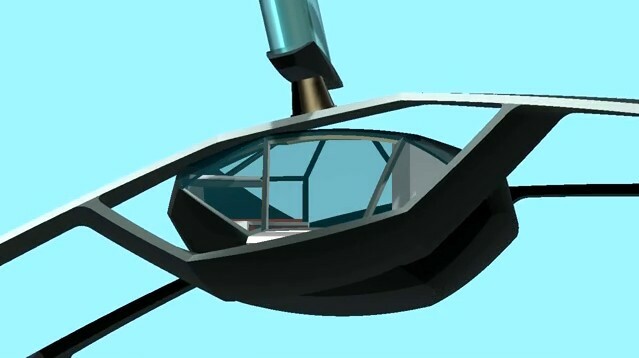 The advantage of C bows is less surface in the hull so you can save some weight but at the cost of a less stiff hull. We at Marstrom think that a Catamaran platform shall be as rigid as possible and does not believe in the old school idea that a soft platform can be good because the hulls can move with the waves. 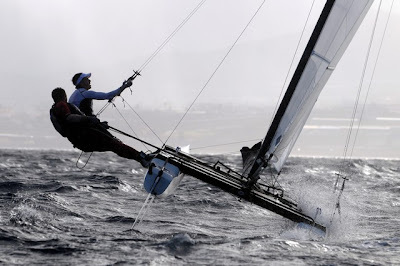 The stiffer the platform the easier it is to control the boat and sails equals better speed. One thing people pro "wave piercing" bows claims is that the wind drag is lower. The relative wind angle close to the water is very small so the so the difference in wind drag between a normal and "wave piercing" bow is extremely small and should not affect the performance We have notice that several of our competitors new designs are not really "wave piercing" but in essentially normal bows that has been reshaped close to the deck to look like a "wave piercing" bow. We at Marstrom think "wave piercing" bows are just a fashion and we can already see tendencies that is on its way out. The bottom shape as well as the scoop and rocker line is quite flat on the M5, what kind of effect will it give and what is the idea behind that? Our philosophy is to design semi planing hulls with rather fully end ships that float more above the water than actually trying to cut it. The trick is to find the right amount of rocker line. Too deep and the hull will be slow in stronger winds and too flat the boat will be slow in lighter winds. 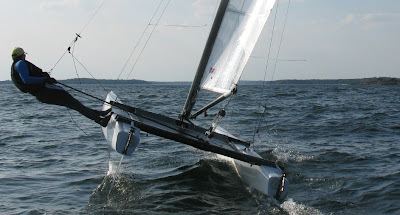 The traditional catamaran hulls are designed on the idea of "cutting" the water and the simplified theory that a prismatic coefficient of 0,5 gives the lowest wave drag. Must traditional hulls have a Cp of 0,53 to 0,57. Full size tests and tests in ship tanks for the last 70 years has shown that the prismatic coefficient must be much higher than the normal 0,53 to 0,57 to get the minimum drag. This is mostly due to drag contributions from skin friction. Other things like spray, three dimensional and surface effects also come into play. 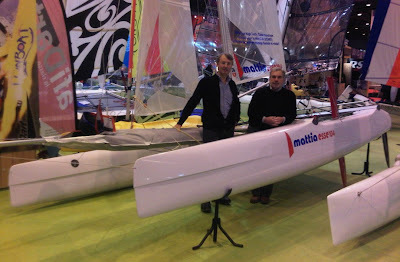 You say that the M5 is semi planing, why not planing hulls and what does semi planing mean. Planing boats creates enough lift at high speed to get on top of the water. Displacement boats have hulls that create negative lift with speed and actually float deeper with speed. Semi planing is a term used for boats that creates none or just a small amount of lift. Creating enough lift to plane from a narrow hull cost a lot of drag and will slow down the boat in most sailing conditions but the top speed should be higher. 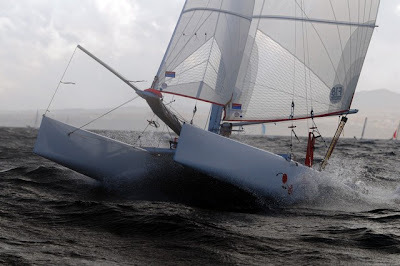 That's why we design semi planing catamarans with just a small amount of lift. The first edition of the M5 had the straight daggerboards but then changed to the Marstrom designed asymmetrical curved foils. How does the curved foils works compared with the straight boards? The first obvious effect of the curved boards is the created lift they give. Creating lift with the daggerboards cost much less drag than creating lift from a planing hull. Less obvious effects are that you can get up on one hull earlier and that it's easier to keep the boat sailing on one hull. It seems that the asymmetrical curved foils shape is very sensitive and it’s easy to fail with the design. How sensitive do you think the shape is for the curved foils compared with straight daggerboards? Yes the shape of the foil is very critical. 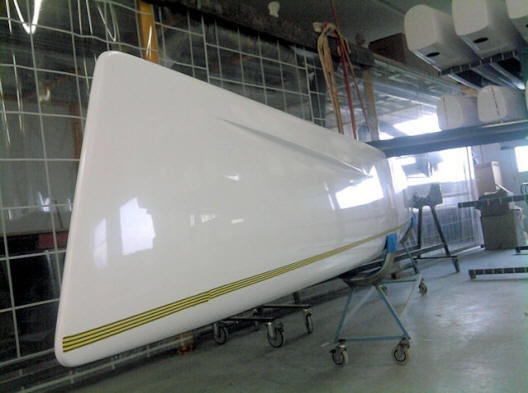 You can totally destroy the performance of the daggerboard with a bad paint job or a small damage at the leading edge or even some dirt on the foil. The shape of the foils is so sensitive that it's very hard make a copy of a daggerboard with the same performance. If you have enough knowledge to make a good copy then you have enough knowledge to make your own design. There are some problems to consider when it comes to designing curved foils. Sometimes the boards will create side forces working against to each other and in other conditions you will have a negative lift at the root and positive lift at the tip of the foil. Both these examples cost drag and one has to design the curved foils to minimize the drag from these two cases. 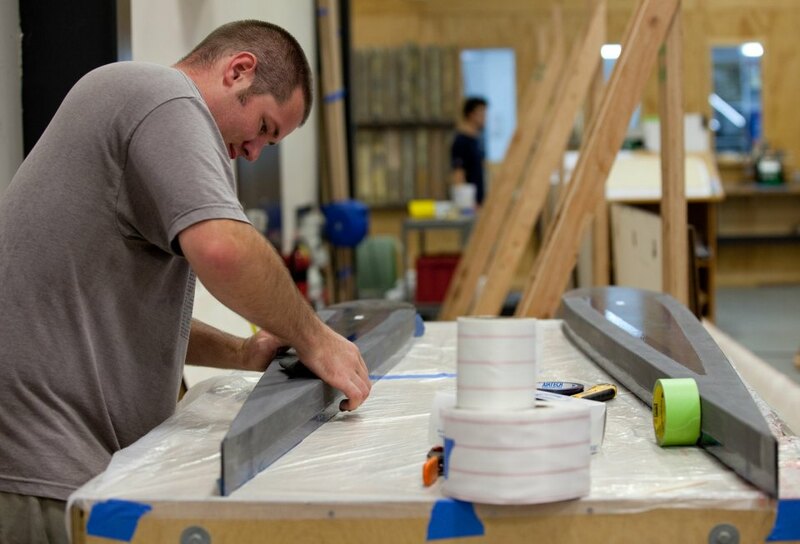 Our solution has been to develop a slightly asymmetrical profile and then experiment with the angles of the foils. We load the tip of our curved board more than on a straight one and we load the leeward board more than the upwind board, all this to find a good balance between lift and drag. There is a lot discussion where to place the daggerboards and the mast, some designs move everything further back. How far do you think it’s possible to go and still get a good balance in the platform? The most important thing is to find a good balance in the boat. 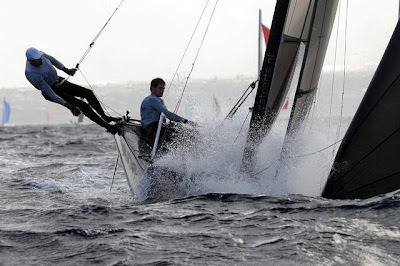 If you have a boat that have a tendency to dive then you have to move back the mast and daggerboards. 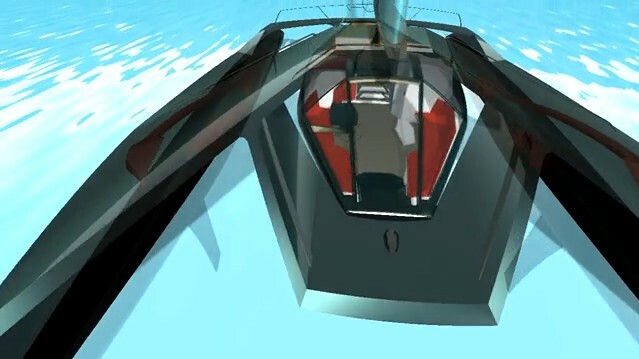 If you move the daggerboards backwards then you will unload the rudders, but if you move them to far back then it will become difficult to tack with the boat, control it at the starting line and sometimes it can even become hard to steer the boat in a straight line. Our hulls has another volume contribution than most of our competitors so our boards are placed a little bit further fwd than most other Acats. Actually the curved boards are placed a few cm further fwd than our straight boards. The M5 is built with epoxy prepreg carbonfibre and autoclaved baked with overpressure and heat, i.e. state of the art technology similar as used to Formula 1 cars and the aircraft industry. 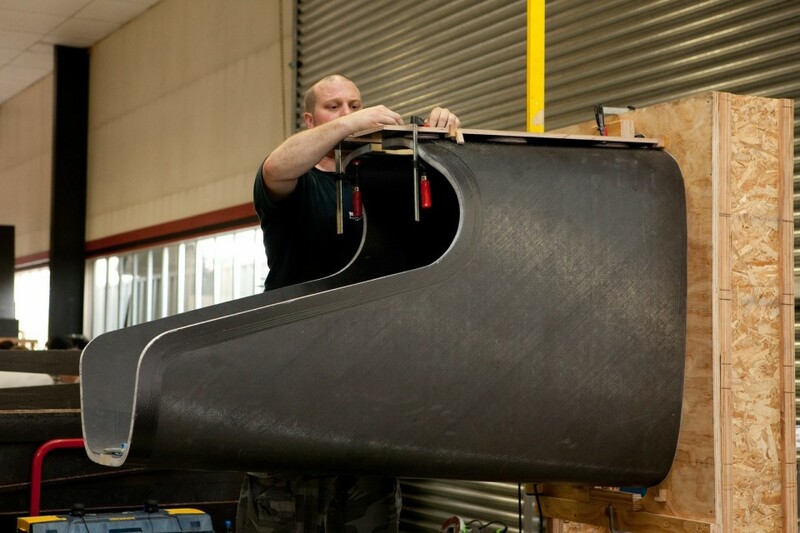 Carbonfibre is a fantastic material but how important is it to use the right production technology in order to bring the outmost from the carbon fiber properties? The production technology is defiantly important for the result. Producing parts in with prepreg materials placed in vacuum bags, a pressurized oven and cured in high temperature gives normally a huge improvement in quality compared to cure the laminate without he pressurized oven. Both the temperature and the pressure helps in minimize the number and the size of imperfections in the laminate. How does this effect the life time value? This makes the product last much longer. 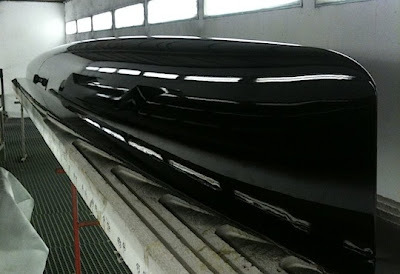 It's no secret that the Marstrom boats have a long life expectancy. The beams on the M5 are bolt on to manage easy assembling and transportation. How is this possible without affecting the overall stiffness? 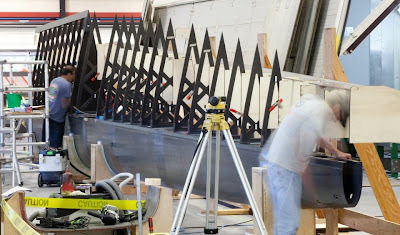 If it's done correctly then a bolted beam/hull connection can be very stiff and the weight penalty compare to glued joint is small. 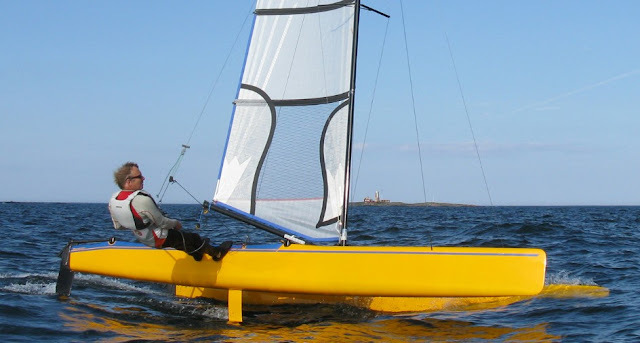 Sascha has been sailing the Marstrom A-cat platform for many years and he is definitely one of the top names in the worlds A-Cat racing scene. 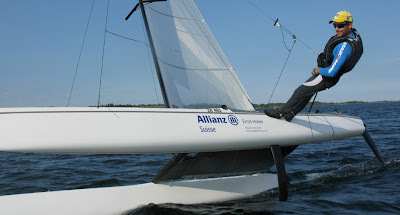 He is sailing the M5 design with great success, 2009 Sascha was 3rd overall / 2nd European in the European Championship and 2010 he was at 6th place in the World Championship. He is also dominating the A-cat racing scene in Switzerland with a huge number of wins. What are his comments about the M5 design. 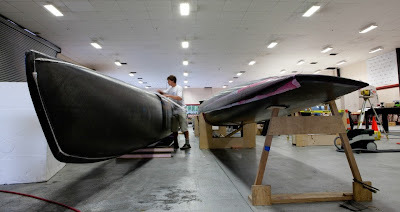 Marstrom Composites has followed it’s own way for many years and especially the bow looks different than most of the other platforms with their Wave piercing design. My results in all wind and wave conditions over the last years as a ‘Tourist-Sailor’ proof that the design of the M5 must be very competitive. You have sailed the M5 both with the straight boards and then changed to the curved foils. 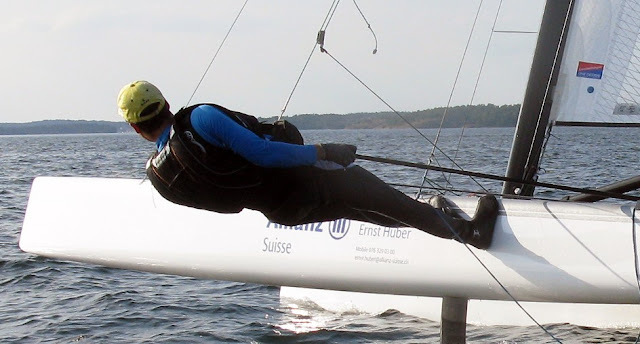 Can you please tell us the effect of the change For me, the curved centerboards from Marstrom Composites made a clear improvement in medium to strong conditions and no disadvantage in light wind compared to the straight boards. It doesn’t make the boat 20% faster, but in a class like the A-Cat that is already on a very high level, small differences in speed can make huge difference in ranking. You have sailed your current M5 now for 3 years and the platform looks like brand new. What’s your opinion of the Marstrom quality and life time value? 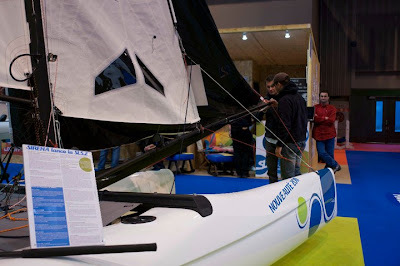 You can discuss the different boat designs with other sailors for weeks without coming to a conclusion, but there is no doubt among the sailors I’ve talked with that Marstrom Composites has the outstanding quality (stiffness, life time, finish, details) among these high-end boats. It was very impressive for me when I was with my family in Sweden this summer, seeing some 15-year-old Marstrom boats looking still modern and being stiffer than most new designs of other boat builders. I’ve been sailing one of these boats and was still fast compared to new boats. Boats of other boat builders at this age are usually broken apart and I’m sure that the owner of such a Marstrom-‘veteran’ can have fun for many more years. Nowadays, all modern A Cats are about the same price. So it’s no rocket science that a boat with 20+ years life time is a much better investment than a boat with shorter lifetime for the same price. Another positive fact for the value of a used boat is the fact, that Marstrom Composites keeps the same model (only details are changed) for a few years and if sth new is lunched, it’s already fully developed so you don’t have to fear nasty surprises. The M5 is designed to be very competitive in all wind and wave conditions. What do you think about the M5 design in light, medium and strong wind? It is very important for me to have material that allows me to have good speed in all conditions; the results in the last years proof that the Marstrom platform is always very fast. Even if the speed differences of most of the newest platforms are very small, I think that the Marstrom platform can handle strong wind easier than the other platforms. 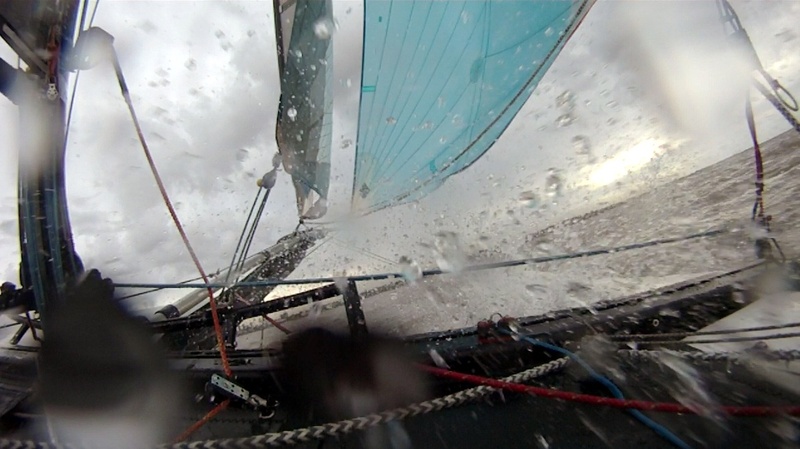 This allows me still to concentrate on sailing fast when others are already in survival-mode. This summer you were sailing the M5 in Loftahammar in Sweden together with Goran and you were changing to the new Marstrom mast, so from now you are also going to use the Marstrom mast. Please tell us your feeling and the reason for the change. When I switched to the Marstrom platform, it was important for me not to change everything at the same time. This is why I kept my old mast until now. Everybody is talking about platforms, but I think that the rig as a combination of mast and sail is at least as important as the platform. Your new mast layout seems to be very interesting: compared to my existing mast, this new mast is stiffer sideways and softer for/aft. This helps to have the possibility to depower upwind when necessary (mast is rotated in) and to power up downwind (mast rotated out). 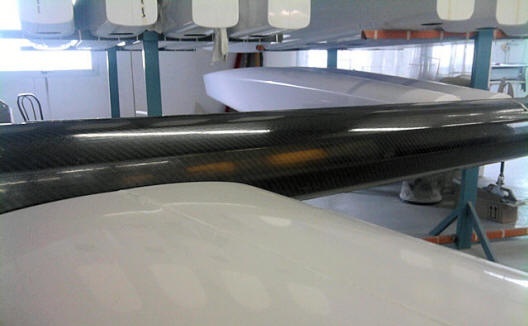 Thanks to high modulus carbon, this new mast is even 1 kilogram lighter than the old mast. The finish is like the rest of the boat a class for its own. With the 1st photo the original AC45 render is being respected. 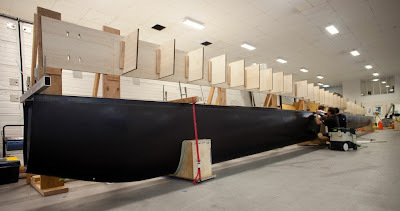 As a reader commented in the previous AC post the hull was divided to fit a 40' container, the photo correspond to the AC45 stern that will be joined to the rest of the hull for assembly at location. Loick wants a new chance at the cup after sailing with Alinghi 5, with his brother Bruno they'll try to challenge BOR in the game these two top multihull sailors know best. More info from the Peyron bros below by Arno. We've been following the DNA since day one, in fact at a given time CSN was the only place where you could get info about it, the same with Alex Udin and SI and other cat projects. Sent by Arno Terra from DNA-ARC . 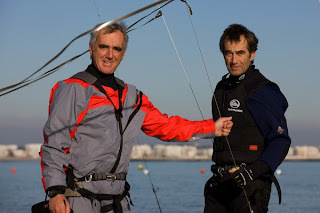 "Last Friday I delivered two boats to Bruno and Loick Peyron at the CNBPP, one of France's most beautiful located clubs at the Atlantic coast. They are in the process of launching another French America's Cup Challenge. It is good to see guys which such a long and succesful track record in big multihulls enter both the A-class and the next America's cup. It is another example how this Cup has a positive effect on the whole sport. 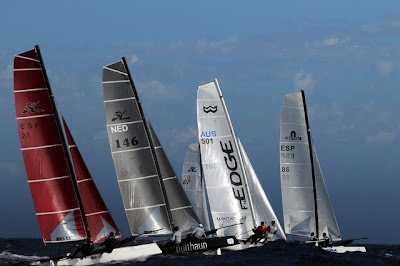 We see A-cat sailors who join the AC syndicates, we see AC heroes enter the A-class and we see offshore around the world multihull sailors step on small boats and inshore AC multihulls. I had very interesting discussions both with Bruno and Loick about developments in the big cats, the ORMA tris and other boats. So were the curved foils introduced by Loick in the ORMA tris many years before these showed up in the A-class. What really surprised me that there seems so little difference in their way to seek performance gains compared to what we do in the A-class and that the same lessons were learned despite the scale factor. 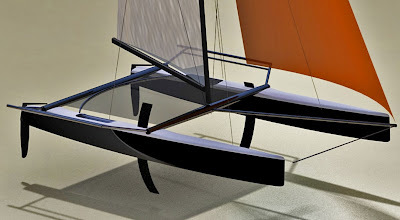 The challenges in terms of amount of rocker, C-foils, volume, etc, of an A-class designer appear to be not that different from a AC72 hull designer or a ORMA ama designer. I think that these brothers have the talent and the knowledge to create a team that can develop, build and sail a competitive A72. 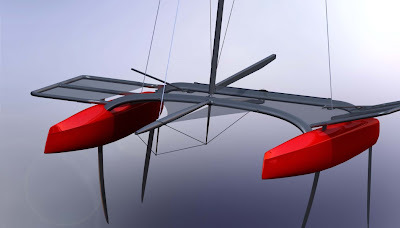 They will use another design approach than the older teams wich I am convinced will be very succesful as no other team can rival them in empirical data about big multihulls. 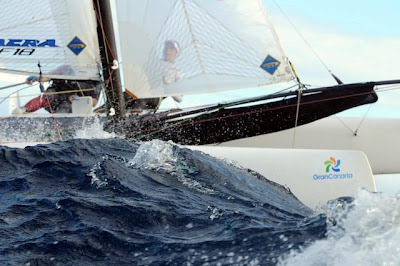 It will be good for the sport and his country if Bruno will find the extra funding he needs for the campaign before the start of the AC45 cycle in March 2011". Pivotal cabin-deck and futuristic looks , Wing included of course. Yet another new cat from Morrelli&Melvin, with their now distinctive bow style, first seen in the VPLP's Banque Populaire V, then USA17 new hulls and recently in the Nacra F20 Carbon and AC45 and Ac72 boats. 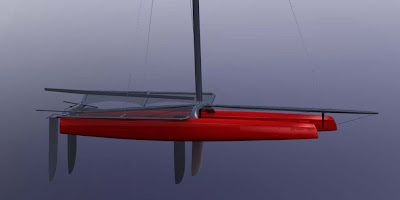 Also beams and bowsprit are Alinghi's A5 and previous cats style like. This new 33 cat will compete directly with the M32. 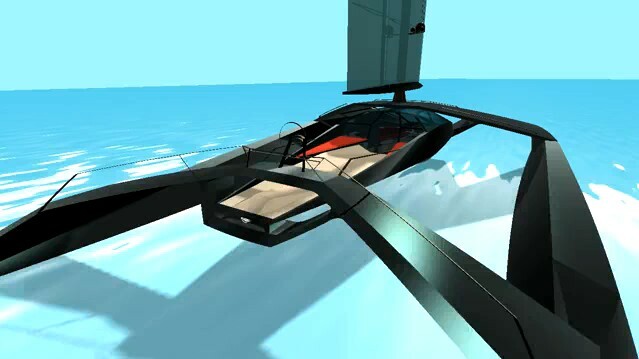 (December 12, 2010) - SL Performance Race Boats GmbH, Morrelli & Melvin Design and Engineering and Hakes Marine announce the production of the SL33 grand prix catamaran. The first platforms are being constructed and will be ready for delivery in early 2011. 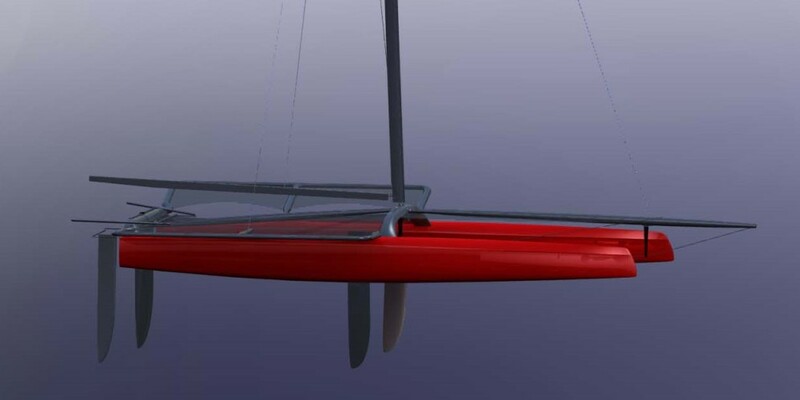 Andreas Labek of SL Performance Race Boats GmbH announced, "Our team has designed and built some of the fastest monohulls and multihulls in the world. We have been staying abreast of the latest America's Cup and world series event developments and know that the SL33 is not only an ideal America's Cup training platform it will be a dynamic grand prix class." The SL33 is just under 10 meters (33 ft) long by 5.4 meters wide (17.71 ft) and 600kgs (1320 lbs). 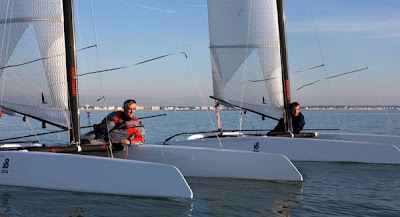 The fully demountable SL33 is optimized for winds under 15 knots, because time and again light air proves to be the deciding factor in distance races. 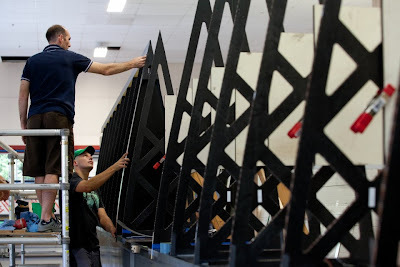 The rig is easy to assemble, take apart and transport. Lightweight and strong, the hulls and beams are constructed of Epoxy carbon fiber prepregs and NOMEX honeycomb cores. Its curved carbon fiber daggerboards and dagger rudders are designed for peak performance across all wind ranges giving the four to five-man crew the opportunity to push hard even in heavy winds and seas. Fold up carbon fiber racks have been incorporated into the design, making the SL33 easy to pack up and transport. I ask again... when St Barths for the F18 Worlds???? By the creativity of Enrico Contreas the new Mattia ESSE 1.04. This new boat is also perfect for mixed crew. Less power and less weight than a F18 but with similar performance. 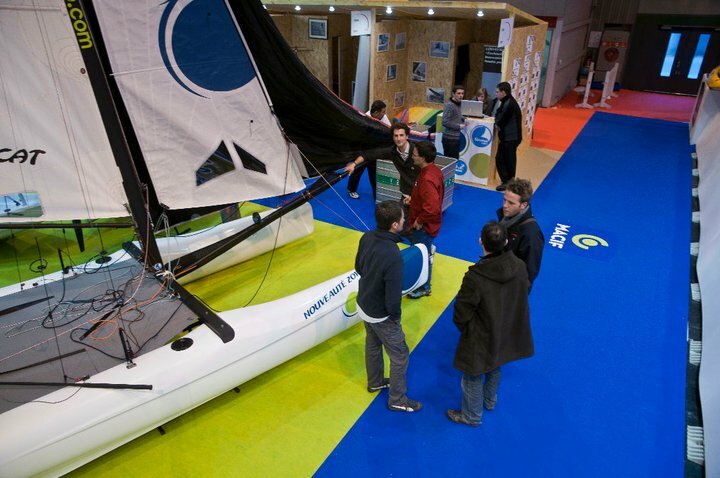 You can see it at the Salon Nautique de Paris. Sent by Valerio Petrucci "X16F - BIMARE start the production of a new F16 HP BIMARE, is now producing an F16HP who's name will be X16F totally designed and produced by the Petrucci family, displaying the italian elegance maintaining the winning lines and the volumes balance. 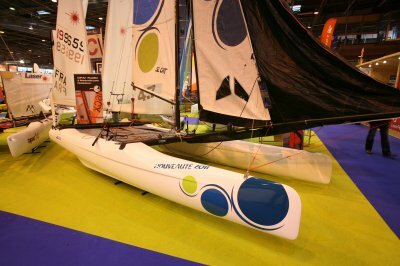 Two versions: standard (x16s) with vinilester hulls, aluminium beams, without gennaker fitting, but with carbon mast, 130kg. And the Race version (x16f) full carbon: mast, beams, hulls, rudders, daggerboads, fittings, 110 kg! Spray rails are here to stay, but with Yves Loday, you can trace them to the Spitfire and Dart 16, my RC16 rails were taken from the Spitfire, I just used them all the way. Now this new SL 5.2 it seems like a daggerless sister of the Spitfire with longer rails and Shockwave looks, of course all designed by Yves Loday. William Sunnucks and Oli Egan are leading the Semana Olímpica Canaria 2010 on a Windrush Edge with Landenberger Sails. After the 2010 Worlds at Erquy the Edge had some excellent results in Germany and now proves again to be a good contender against the other top designs. Photos from Erquy: Left Mischa and Bastian , right Olivier and Arnaud. Left boat and sails on the right are in Argentina right now. 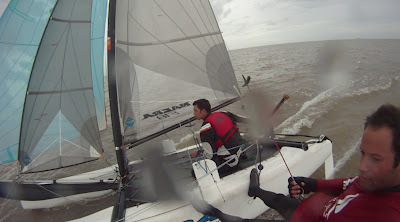 ----October 20, 2010: Yesterday in a training session for the upcoming Buenos Aires Week, I sailed for the 1st time a Hobie Wildcat... not any standard factory boat, a special one, with a combo that only two people has ever sailed till now, the owner and I. Why so special? well , it was Mischa's black beast sailed at Erquy, with Olivier Backes World championship winning sails. The perfect Wildcat Merge.Perfect conditions: flat 5-10 knots...Sweet boat. Complete report after BA Week ends due to some courtesy with a distinguished guest coming to Argentina to promote the class. Update: Here you have the full report:Finally I could sail the Wildcat in a training race session, 5-10 knots almost flat, the boat was a rocket that over performed the top guys here in those specific conditions. I helmed her going to the course area, it felt really easy on the tacks, and gral driving, it felt 'ligther' than other F18s, 'snowboarding on powder' like sensation, and we have muddy waters here... Real quick on responses too, precise and smooth. Definitely a different feeling. We made 4 pratice races with 3 more boats, 2 of them the top sailors of our fleet. 1st race, we ended 4th at the Windward mark, and started the downwind leg behind a train of the front 3 Infusions, so instead of gybing, we decided to give a try on speed, we start gathering speed pointing higher to windward, we were passing them like they were stall, so they all gybe, we stand the course up to the layline, then more speed and an impressive win from behind but coming on the same tack, I never saw that kind of pass against top fleet sailors, at least live . 2nd race, we started bad, and the other 3 went left with more pressure, we made some meters and tack, going to their same side, we managed to trim the boat with low trapeeze style and the hull in the air perfect balance just skimming the water , steady wind, no changes at all, the boat started to gain angle at a constant speed, the helmsman of course was smooth too, I maintained speed and balance with the main sheet, then tack at the layline , free way , none around, started looking for them, and they were easily half leg? or more below, it was a perfect kill, we even have to wait them at the windward mark cause it was a real shame, another game altogether. I was quite surprised with the performance, it was another league in those flat mid range conditions. We sailed quite well but we knew the boat was helping... a lot. After helming the boat with more wind later I think is possible to manage her in our higher winds and short steep waves. 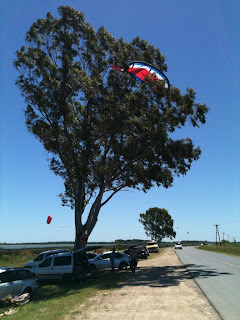 One Wildcat from Uruguay was racing the BA Week, they were not experienced at all, and they managed to 'survive' on those harsh conditions, so it was a good sign. The tested Wildcat actual owner, Sergio Mehl, had some really bad pitchpoles while free sailing on higher winds and chop so he decided to race with the C2, with excellents results too. 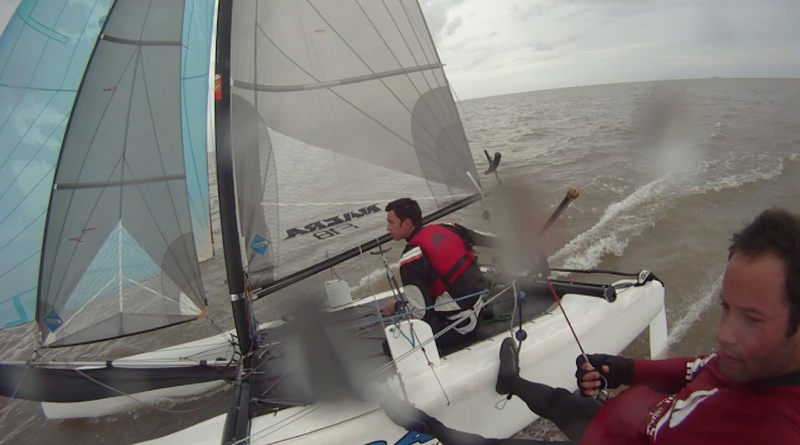 In the last Argentine Nats, he was top two with the C2, and the last day he broke the spinpole , he changed to the Wildcat (was disqualified afterwards) and in the same wind we had our described training he made some impressive sailing, like starting 100mts behind due to an individual recall and finally winning that race, of course you may guess that this guy is now the fastest on our fleet too, but surely not the best racer... Cruz Smith and Mariano Heuser are quite as fast too on their Infusion and surely the top racing performers, currently Argentine F18 champs. Later I contacted Martin Fischer and he told me the Wildcat was designed to excell in mid range conditions. 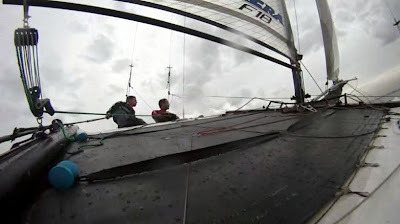 As pointed above, the boat I sailed is Mischa's blackie with Olivier's winning sails... a truly special boat with long daggers that cost 3500Euros, special standing rigging wires and some special sails for sure too! 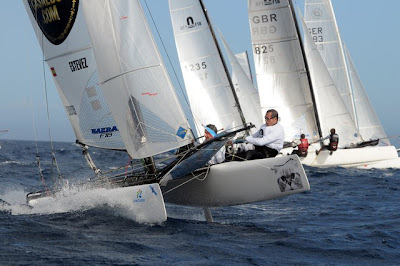 The success of the F18 class is based on the even performance of the different designs, some boats have advantages on different conditions, but finally the game is always tied , and sailors make the difference but the class must limit some aspects that make boats too expensive for the average sailor, best example is special standing rigging and extra long and custom made daggers, rules are being revisited to address these points. Alex Udin is there too. Now it seems they are finishing a new catracing weapon. He told me once here in CS that it will fly, now I know why....... stay tuned. I also asked Martin about the negative rocker on the Cirrus 'R' as in comments someone pointed Fischer used it before , and he told me he is been using that feature for years, but as I pointed out to him, never to such visible extreme. He refered to it as a 'hollow section' that reduces skin friction but has some penalties too, as with every single design feature.